Do not practice these techniques on other people. These techniques can cause serious injury and have a high potential to be lethal. 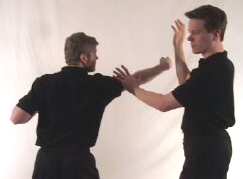 Do not use these techniques unless it is to defend yourself in a serious life or death situation. Also, do not practice these techniques at full speed or power or with real intention on another human being or on any other living thing. 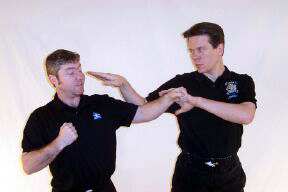 For example, a serious knock out hit to the jaw can shatter the jaw and if the intent of the force or the physical force is driven upward with enough power then the strike can break the small bones of the cheek or and the connecting eye ridge causing such massive trauma that the injured person will die from the shock let alone the trauma. One of the dangers of learning a true method of 1 Hit Knockouts is that quite often, at first, the practitioner can’t tell how much power they are generating and assume that since they don’t feel much power that they don’t have the hit yet or that they are not generating a knock out hit. However, once true knock out power is learned it is generally easier to do a knock out quality hit than it is not to do one. So, students have to be seriously warned to be careful not to really hit their training partner(s) when practicing. There is, of course, the liability issue but even more than that is the real possibility that someone can get seriously injured because the practitioner doesn’t realize their own power. So, we never hit another person with even a medium hit and certainly not with a fast speed or penetrating strike. We limit our hits to air strikes or striking on boards, bricks, bags and pads and will only demonstrate very limited hits to a person on rare occasions. When one of my senior students first learned “No Distance” hitting he did not understand how serious these hits really are and consequently he broke 2 different training partners ribs by mistake before he realized he could not even moderately practice on people. Fortunately, he was not hitting any major pressure points or he may have done much more than just crack a rib or two. He honestly didn’t think he was hitting with any power. I have always warned my students about the dangers of these hits but ever since his experience I have always EXTRA stressed the importance of not practicing these hits on people and that is why I am sharing his experience with you. 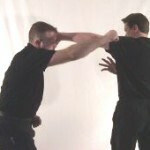 There are different kinds of knockout hits including but not limited to pressure point hits that require a series or combination of hits to achieve a knockout. This kind of knockout hitting is very popular today in Okinawan and Kenpo Karate. The series combination pressure point method is also the way that I was originally taught to apply the moves in my Kung Fu forms. 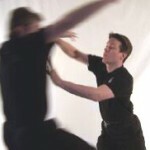 Kilap Silat is an art that usually hits multiple pressure points all at once with the same strike causing a system overload that causes a knockout. Fa Jing or explosive energy hits emanate from the entire body and tend to be whip like. Most real Tai Chi and Internal Arts instructors know or have a version of Fa Jing in their art. 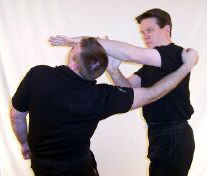 Whole body power striking is typical of the hitting method in Poekilan and Tji-Mande Silat. Some advanced hits include Poison Hands, Shock Power Hitting and Vibrating Palm Hitting. These skills can be found in most Internal Arts but are much less commonly known. Other advanced strikes include 1 Touch Knockouts and short distance knockouts including heavy hand techniques. 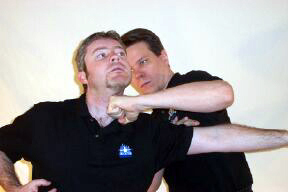 A 1 Hit Knockout can be as simple as a finger jab to an eye, a punch to the throat or a light slap to the testicles. 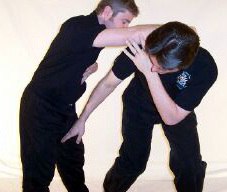 A 1 Hit Knockout can be as sophisticated as a light tap underneath the jaw at the correct angle and direction such that the person just drops, a whole body power hit, to snap the arm, that is done in such a way so that the person who receives it goes into shock from the trauma and passes out, or a specialized frontal or side strike that causes the heart to fibrillate and then the blood circulation stops temporarily or permanently causing death. A light tap underneath the jaw. 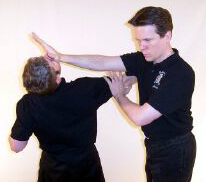 In Kun Tao and Pentjak Silat there is a study of striking the joints to disable an attackers ability to physically move in case the attacker is crazed (or in today’s world on drugs or heavily under the influence of alcohol) so that the attacker is unable to continue. I place this body of information as a priority along with my study, practice and teaching of knockout hitting because I believe that the average attacker on the street is not in their right mind to begin with. A properly executed 1 Hit Knockout looks like the person throwing the hit barely did anything. One of the simpler and more advanced 1 Hit methods has been described by one author (Gilbey) as a just a dinky little poke. From watching the film footage I believe that this is the kind of hit that Cassius Clay (Muhammad Ali) used to hit Sonny Liston. Also, when a 1 Hit Knockout is done correctly the opponent typically falls like a sack of potatoes. Once a good 1 Hit Technique has been trained in it is common to feel like you aren’t doing anything to make such an enormous impact when delivering the strike. To the person who is executing the strike the hit feels like nothing. To the person receiving the hit it is game over! Several people that I have trained have had to use this technique in a real situation. The vast majority of the time, the result of the strike was that the attacker was instantly knocked out. In one case the student hit the attacker on the arm and the hit was so powerful that it instantly snapped the attackers arm. 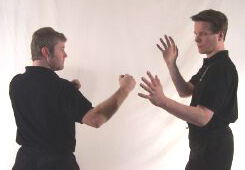 Properly trained 1 Touch Knockouts (Tai Chi, Shaolin & Petjut Silat) have an even much less feeling of impact to them than 1 Hit Knockouts and are usually done very quickly. In fact, typically they are done fast enough that the point of impact can not be seen by the average person. When someone really has the 1 Touch technique perfected they usually will not feel any impact at all from delivering the hit. However, when done to a 1 inch thick pine board the effect to the board is shattering. 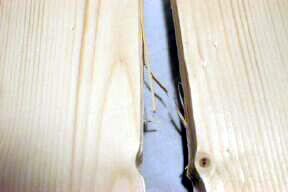 The first board has a clean break pattern along the grain. One inch hitting is similar to that of a highly refined 1 inch punch and tends to have a shattering effect on boards although different kinds of energy can be applied for different effects. I have included a photo of a board hit with a basic palm heel iron palm quality hit and one with a 1 Hit Knockout explosive hit. 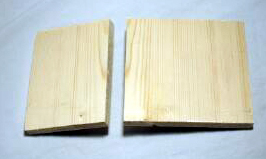 A good shock hit can be practiced by holding two boards in your hand and breaking only the second board. On a person the effect can be manifested in different ways including but not limited to the recipient moves or flies 8-12 feet or more or the recipient feels a deeply penetrating hit but is hardly moved at all. A large heavy bag (over 120 lbs.) with someone who knows what they are doing and what they are feeling for holding the other side is a good and safe way to work on manifesting the different kinds of power. Another good way to train one inch hitting power is to break patio blocks with it. I only recommend trying this under the guidance and or supervision of an instructor and I highly recommend easier breaks before advancing to the kinds of breaking I have been describing in this article. No distance hitting at an intermediate level tends to look like the person doing it shrugged or let go of something very quickly or sneezed. At an advanced level the person doing the hit looks like they barely moved. The recipient feels a jolt go through their body. At a really advanced level the energy of the hit can be directed through the recipients body and sent out through anywhere on the recipients body or it can be made to stop so that serious trauma is caused. Our students mostly practice no distance hitting on boards or on a heavy bag. The first level of this hit can be done on a heavy bag such that when the bag is struck it does not move and the person who is holding the bag gets knocked away from the bag. In the past I have had friends and students in the construction business and was granted access to a few houses, to practice on, prior to them being torn down. In my practice of no distance hits I have broken doors that were slightly ajar including taking one off of the hinges and by directing my energy I was able to hit a wall and caused a window to break that was over 8 feet away. I am not trying to brag here. One of my primary instructors is Willem de Thouars (Uncle Bill) and his striking ability is much greater than mine. 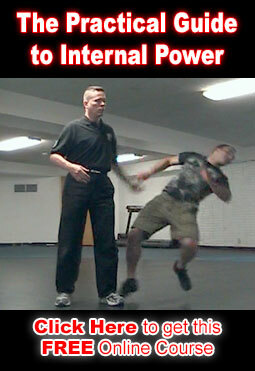 Several other teachers I have studied with are also very impressive pressure point and energy power hitters. In this article I am simply stating what I have personally experienced with this kind of hitting. Many pressure point systems focus a lot of attention on where and even when to hit. Where to hit is important but it should not be the first priority. It doesn’t do you any good to know where to hit if you can not manage to hit there in a real situation when you need to save the life of yourself or a loved one. 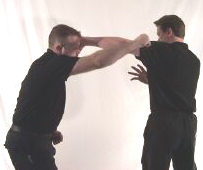 One of the basic problems shared by many people who study pressure point hitting is that they are unable to use their knowledge in a real fight. My personal belief is that if you can not use your self-defense art in a real situation then you are wasting your time. 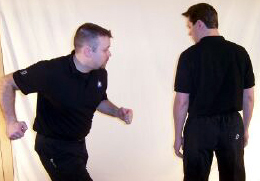 One of the basic problems is that in a real fight the action is to fast for the average person to hit a specific point or area on an attacker even if the thought crosses their mind to do so and because the targets are constantly moving the situation is quite different than the way most people practice pressure point hitting in the kwoon or dojo. Also, when adrenaline kicks in fine motor movement tends to diminish to less than 40% of what it is normally which means that it is very difficult to hit any one half dollar sized spot on another human being with any accuracy and most pressure points are smaller than a half dollar. Another problem is that many people are what are called non-responders or partial non-responders (I have personally seen indications that this is more than 1 out of 10 American people) to pressure point attacks and if a person is under the influence of drugs or alcohol and they are out of their mind they won’t be affected by a hit or they won’t feel it until much later. So, although where to hit is a very important body of study, where to hit should not be your primary body of study unless you are seriously interested in acupuncture or the medical side of pressure points. I believe that it is good to get exposed to as much as possible while focusing on really learning essential techniques that can be used in a wide variety of situations and circumstances. Learning (by which I mean practiced to the point of excellent proficiency) about 12 to 36 good places to hit along with 6 – 10 good entries (places and ways to first engage an attacker) is plenty for a beginning (first 3 years) practitioner. The 6 – 10 good entries should be versatile enough to handle hundreds if not thousands of different scenarios and the places to hit should be readily available on the average person most of the time. 3 – Second strike the the attackers head w/other hand. By engage I am not recommending that you strike first in a situation because if you seriously injure or kill the attacker then you may have serious legal problems and if and when it is found out that you hit them first you may have actually broken the law (according to my attorneys), so, I always recommend to students and I recommend to the readers here that you should exhaust every possible option to escape and deter an attacker before engaging them. It doesn’t do you any good to win the fight and then spend the next ten years in jail. I consider my freedom to be a part of my reason for studying self-defense. Unfortunately, I have been attacked on the street over a dozen times. Because of my training method I have only had to hit a few (less than one out of three) of those attackers. All of the fights where I or a student has actually had to hit another person have been over in less than 30 seconds and most of them only lasted 1 to 3 seconds. I have found it to be common that when to much attention is placed on where to hit that not enough attention is placed on how to hit. 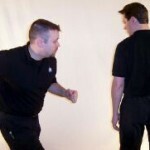 By how to hit, I am referring to things that are really essential to having a good ability to deliver a fast and powerful knockout hit in a real self defense situation. Some of the essentials to throwing a good 1 Hit Knockout are Proper Body Mechanics, relaxation, positioning, whole body movement and power, Knowledge about breathing and safely generating Explosive Force and using physical principles such as gravity and compression. This includes moving in a way that protects your own joints, wrists, elbows, shoulders, back, and neck. 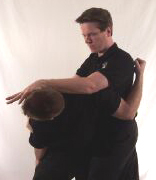 Our system also trains Iron Body and Golden Bell techniques to help protect the student and so that our more advanced students can not be affected by the majority of pressure point techniques. To achieve a good 1 Hit Knockout it is also necessary to have some understanding of the body. This can be in the form of pressure points, internal body organs and structure or ways to strike the eyes, throat and groin or/and knowledge of vulnerable areas such as the knees and other joints of the body. 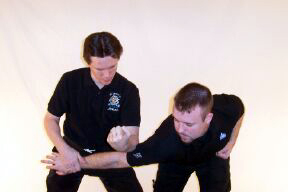 In our system of Kilap Kilat Kun Tao Silat knockout hitting is one of the main areas of study with the emphasis always being on practical self-defense. Dim Mak and more advanced palms such as various levels of Poison hand, the Iron Palm, Vibrating Palm, Cotton Palm, Burning Palm and the Delayed Death Touch are taught later in the system. I hope this article has given some insight into 1 Hit Knockout Strikes and hitting methods. In this article, I have briefly touched on the subject of 1 Hit Knockouts. It would take volumes to be able to explain all of the possible techniques in full detail. In addition, I would like to thank my teachers Masters Tyrone Jackson and Uncle Bill from whom I have obtained some of my information on this subject. I would also like to thank all of my teachers for the wonderful knowledge they have bestowed upon me. Any errors made in the writing of this article are strictly mine and should not be taken as a reflection of any opinions other than my own. This article was written with the greatest respect and admiration for all of my teachers.